STYLEDOM - Style & Freedom: Back to School Giveaway! It's back to school and back to gift giving! 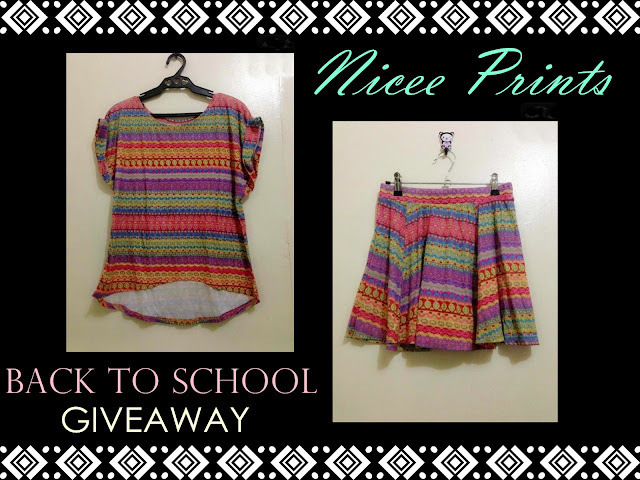 We are excited to bring you this giveaway where in one winner will have these aztec top and skater skirt from NICEE PRINTS! Isn't that fabulous! Join here and win! That easy! so what are you waiting for? Join now! This giveaway is open for Philippine readers only. This giveaway will start on June 7,2013 and will end on June 15,2013.
and will be announced n June 16,2013. Winner was drawn last June 20,2013 via random.org by a third party. Winner my claim her prize by leaving a personal message with her details via facebook page Jaqui Perez. Thank you to all those who joined this giveaway! We are excited to launch a new one courtesy of NICEE PRINTS! A lifestyle blogger, wife, mother, and a child of God.